Editorial cartoon depicts President Obama, First Lady targeted by a drone. 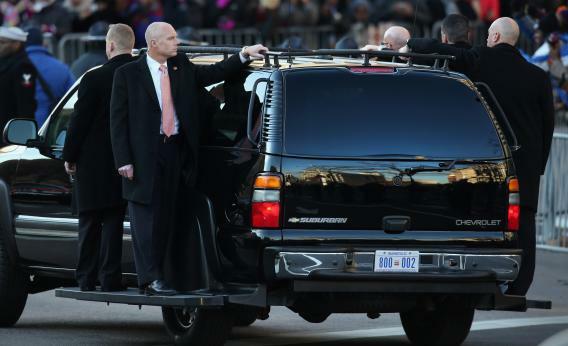 A Secret Service vehicle escorts President Barack Obama and First Lady Michelle Obama’s motorcade during the inauguration parade on January 21, 2013 in Washington, DC. It wasn’t exactly a subtle cartoon. On March 8, Norm Augustinus pasted an animated gif at the top of his website—a drawing of the White House, the president, and the First Lady. Over a dozen-odd frames, a drone (marked “drone”) hoves into vision and kills them both with lasers. Vice President Biden wheels Nancy Pelosi into the scene; they get lasered, too. According to Augustinus, who first told the story to Roll Call, he got this email on March 11. (normaugustinus.com), is in violation of Title 18, United States Code, Section 871 (Threat Against President). You have ten days to remove said cartoon or face dire consequences. Augustinus started sharing this with the media, but only Roll Call ran the story—and it ran it to debunk it. Why? Among other reasons, there is no “Roland K. Anders” working for the Secret Service. The branch that protects the president and his family is the Presidential Protective Division, not the Protective Division. The spookily-written email is a hoax, on somebody’s part. This is their (the SS), spin to extinguish this story. The SS email gave me ten days to remove the cartoon. Sure enough, they were here on the tenth day. The government sends that much fire power out because of a fake email or a fake letter? Hardly. If Roland Anders doesn’t exist, with all their resources, why not track down the source of the email? Track it and expose it and then properly diffuse this story. Why come to me? Because it was about the cartoon and because governments coming after cartoonists doesn’t look good they had hoped to get me to remove the cartoon quietly and come out unscathed. That’s what’s going on now. Do they also deny their visit? In 2012, way ahead of the curve, Jeffrey Goldberg wondered whether drones were the “new black helicopters.” The evidence builds every week.